Glossy and smooth, textured and patterned, stained, stamped, stenciled — sometimes it seems like when it comes to decorative concrete, it’s all been done. But then along comes a contractor (or an architect, or an engineer) who dreams up an entirely new way to work with the medium. Take, for example, the ingenious ways that people have found to explore the relationship between concrete and light. The three products below — LiTraCon, Sensitile, and Ambient Glow Technology — testify to the fact that there’s virtually nothing you can’t do with concrete. Chosen by Time magazine as one of the Coolest Inventions of 2004, LiTraCon has garnered a lot of attention in the last 10 years. And no wonder — translucent concrete is, as Time suggests, undeniably cool. LiTraCon was invented by Hungarian architect Ã?ron Losonczi when he was a student at the Royal College of Fine Arts in Stockholm, Sweden. “I started to think about light-transmitting concrete after having been inspired by an artwork,” says Losonczi. The artwork in question had incorporated glass into a concrete surface, and the filtered, shifting light through the glass gave the piece a unique quality, he says. Losonczi was thereafter determined to bring this same effect into the realm of architecture. And so he has. 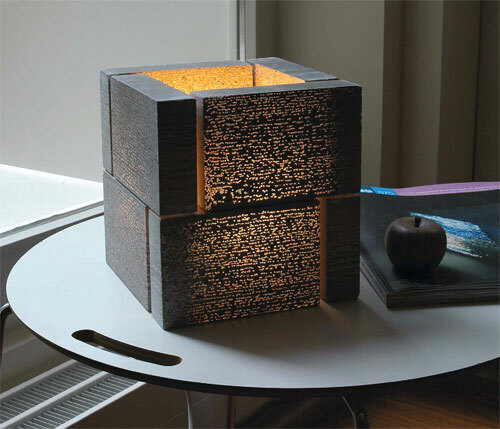 Losonczi’s product — for which he holds United States and international patents — uses fiber optics to transmit light from one side of a concrete block or panel to the other, creating a unique filtered light effect. But that’s not the only thing that makes LiTraCon remarkable. The light transmission isn’t affected by the thickness of the wall. Fiber optics are used in telecommunications because they can transmit data with minimal loss, and the same is true when transmitting light. “Thanks to the low loss of light in the fiber optics we use, there is no difference between, (for example), a 1-centimeter and a 1-meter thick wall,” says Losonczi. LiTraCon comes in prefabricated blocks of 11.8 inches by 23.6 inches that range in thickness from 1 inch to 19.7 inches. The fiber optics, distributed organically throughout the blocks, make up only 4 percent of the total mass, leaving the blocks with a compressive strength of more than 7,000 psi. The blocks have a glossy polished finish, ensuring, says Losonczi, that the light comes through to the surface clearly. The material is available in three different colors, and LiTraCon also offers the option to order custom sizes and colors. With that kind of versatility, the range of applications for LiTraCon is considerable. The product has been used in projects all over Europe and Asia that range from illuminated pavement in Sweden to a translucent logo wall in Hong Kong. Most recently, LiTraCon was incorporated into an award-winning veterans’ memorial in Iberville, La., which, Losonczi says, is one of his favorite projects yet. “I like the Iberville Memorial, as LiTraCon became an important and symbolic piece of a poetic architectural project,” he says. Although LiTraCon is new to the States, Losonczi says the company is working on getting a rep here within the year. 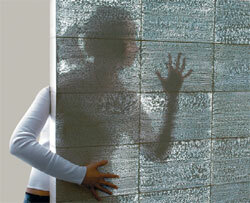 For now, the Hungarian company remains ready to help you make translucent concrete part of your next project. In order to recreate this in a concrete surface, Lath’s design features embedded “light channels” — U-shaped fiber-optic pieces that are sunk into the concrete so that only their ends, or terminals, are visible on the surface. “As you move on the surface and block random terminals,” Lath says, “your shadow is literally transmitted and reimaged within the material, causing a larger — ripple’ effect.” The Sensitile Terrazzo experience is therefore dynamic, depending not only on light, but also human interaction to achieve its effect. Sensitile has also recently expanded its concrete offerings to include Terrazzo Lumina, which uses similar technology to turn a single light source into many distinct points of light across the surface. This effect is also achieved with embedded fiber-optic channels, which branch out from an external light source installed behind or alongside the tiles. The Sensitile Terrazzo tiles are available in small (6-inch by 6-inch or 8-inch by 8-inch) tiles that are just an inch thick. Also, larger 1.25-inches thick tiles range from 1 to 4 square feet. Terrazzo Lumina tiles are 1.25 inches thick and come in a standard size of 24 inches by 48 inches. Both products are also available in 10 standard colors. Still, while these preset options are available, Lath says Sensitile is mainly a contract manufacturer and does a lot of work to specifications. He says they manufacture a lot of custom countertops and slabs in their Detroit plant that are then delivered as a sort of “a kit of parts, ready to be seamed on-site.” The chances are good that any use you can dream up for light-transmitting terrazzo, Sensitile’s products can accommodate. Peter Tomé, creator of Ambient Glow Technology, has taken a different approach to incorporating light into concrete. His photoluminescent aggregates can turn literally any concrete surface into a glow-in-the-dark design or safety feature. Made by Toronto-based Universal One Corp., AGT is sold as either sand or stone aggregate and can be applied in a number of ways. The sand, which comes in two grades, can be broadcast directly over the surface or mixed into a finish coat to produce a photoluminescent appearance. The stone aggregate is available in 8 mm or 12 mm sizes and can be used in a wide variety of poured, precast or cast-in-place surfaces. Universal One president Peter Tomé says clients have used AGT products in projects ranging from concrete countertops and floors to patios and pool surrounds, achieving very striking results. “Contractors out there are looking for something new to position with their potential clients,” says Tomé. And AGT can certainly give them that. These light-energized aggregates needs only brief exposure to a light source — any light source — to produce a steady glow for hours thereafter. Specific times and light outputs depend, of course, on the strength of the light source and the type and concentration of AGT aggregate used. In any case, AGT used in an outdoor placement can glow all night powered only by the day’s exposure to the sun, Tomésays. These “energized surfaces” are not only a creative way to bring light into a project, but they’re also very eco-friendly. The patented aggregate is nontoxic and emits zero VOCs. This is a side of the product that Tomé is very excited about. AGT can make a positive contribution to a project’s LEED performance. “Our product is sustainable, eco-friendly and LEED-friendly,” Tomé says. Providing not only a “passive light source” option for the eco-conscious consumer, but also an array of decorative effects for contractors, AGT’s product line is full-featured. It takes photoluminescent concrete projects to the next level.